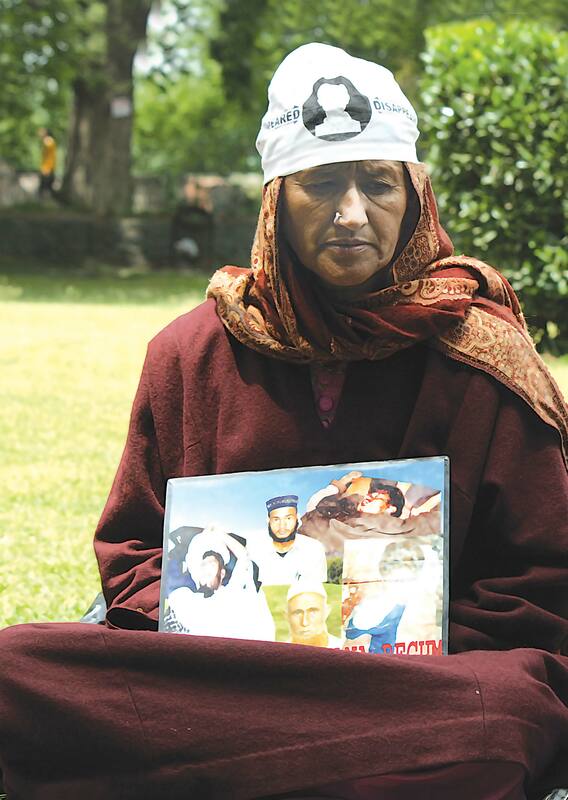 Jana Begum protesting in Partap Park Srinagar against the disappearance of his son. Since last two decades Jana Begum, in her early 80s, would sit on the porch of her wood-and-mud house in this postcard perfect Dilbagh village in remote Kupwara. The porch overlooks a small courtyard, and beyond that are hills covered with dense pine trees. Invisible to Jana’s eye, on top of that hill, is the place that refused to fade from her memory – a garrison. Everyday Jana looks towards the treetops trying to find a way inside the garrisoned walls of the camp to fill the blanks of her devastated life. “They took six of my family members,” says Jana while pointing towards the hill. During early 90s, Lolab Valley was quite contrary to what Allama Iqbal said in his poetry. Many of its villages including Dilbagh and Devar, were more than a tourist attraction. The hills surrounding the valley were marked by footprints of enthusiastic and dreamy young Kashmiris, who would trek through to cross the LoC and get trained in handling arms. 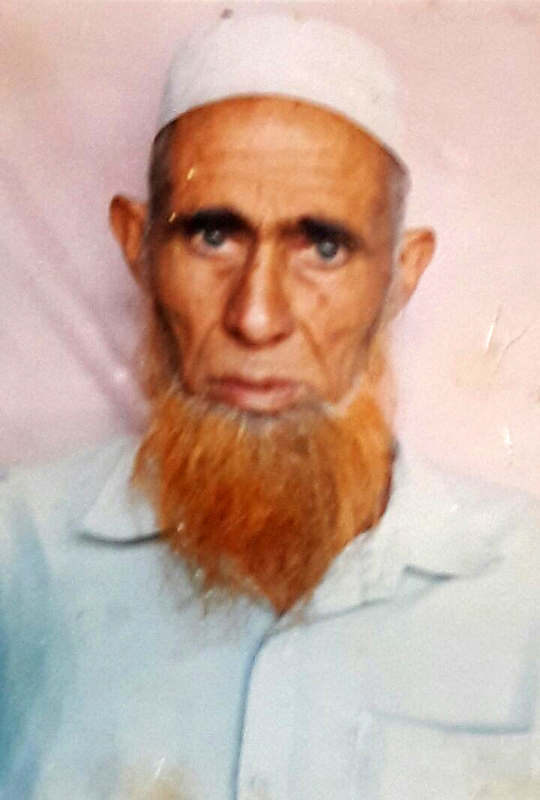 On a calm evening in May 1996, Jana’s son Latief Ahmad War, then 20, was repairing his wrist watch near the window, while others in the family were busy preparing for dinner. Latief’s younger brother Sharief War, then 17, rushed towards a neighbour’s house to arrange a taxi for ferrying his wounded brother to hospital. “But by the time Sharief returned, Latief was already dead,” said Jana. Next few months Jana and her family spent in mourning and fear. “But then life had to move on,” said Jana. Jana’s small house wore a celebratory look when her elder daughter, Khalida got married to a local boy, who works in Srinagar. A few months after Khalida’s wedding, Jana and her husband started making preparations for Sharief’s nuptial. A week before Sharief was set to get married; he travelled to Srinagar for some last minute purchases with his younger brother Muhammad Bakkhtiyar, then 17. 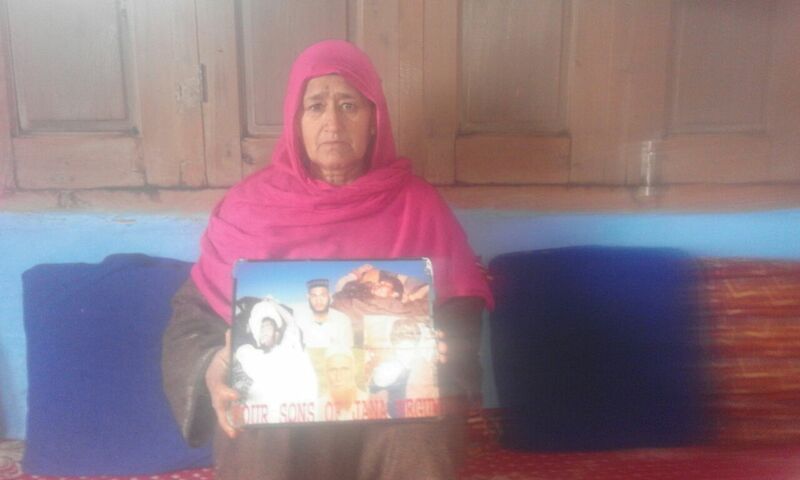 To make sure that nothing untoward happens with her sons Jana accompanied them till Kupwara. 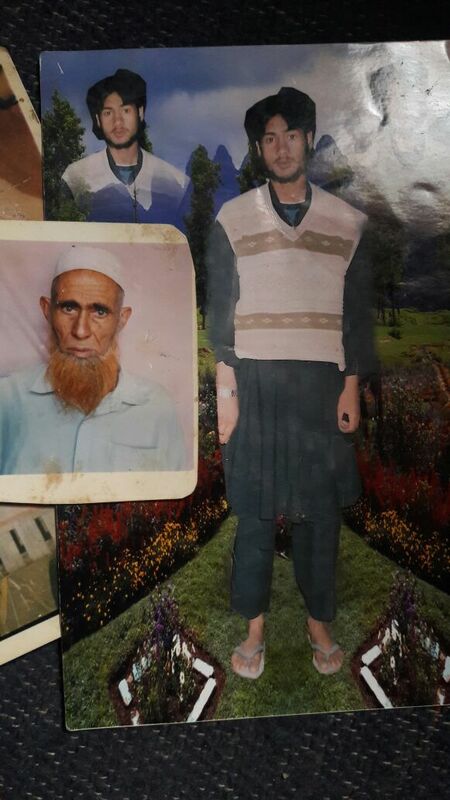 Once home Jana learned about an encounter in Bumhama village, 2 kms from Kupwara. “I began to worry,” recalls Jana. But Jana’s husband calmed her by assuring that both Sharief and Bakhtiyar must be in Srinagar by now. He was wrong. Even after three days when Jana and her husband didn’t hear from their sons, they began to panic. First they searched in Kupwara; then they visited the mosque in Srinagar where Bakhtiyar lead prayers. “But nobody had seen them,” recalls Jana. The search went on till the day of marriage. A few days later government announced an ex-gratia relief of Rs 1 lakh for Jana’s family. But the announced bought more trouble than any relief to the family. Jana’s husband was accused of receiving money from militants. “Fearing they might harm our father we lodged a complaint in the local police station,” said Shabir. Once back, elders from Dilbagh village took a procession and marched towards the army camp where Jana’s husband Abdul Karim War was held. Same evening, unable to bear the pain, Karim closed his eyes forever. “He was dead,” said Shabir. Allegedly Karim was accused of harbouring militants in his house. “Even before this episode my husband was summoned to the camp almost every month,” alleges Jana. “I too was often called to the camp. I was also tortured using cigarette bits and razor blades,” alleges Jana, while showing the torture marks on her neck, legs and other body parts. Since then Jana is on regular medication for anxiety and post traumatic stress disorder. “After every round of questioning and torture, they (army) would put a Rs 500 note in our hand and warn us not to open our mouth,” claims Jana. Four tragedies in less than two years had shattered Jana’s once big happy family forever. “Nobody could get over the nightmares that followed,” said Shabir. The responsibility to feed the family fell on Jana’s 18-year-old son Shareef-ud-din, a teacher at a local madrassa. “He would earn Rs 3000 a month,” said Shabir. The next three years passed in silence for Jana’s family as they rebuild their lives, step by step. In the meantime, Shareef-ud-Din got married to a local girl from a nearby village. “We had almost restarted a normal life when tragedy stuck us again,” said Jana. It did on the day when Shareef-ud-Din’s wife gave birth to a baby boy. Excited, Shareef-ud-Din went to his in-laws place. It was 2001. Jana and Shabir went to the said forest to find Sharief-ud-Din, but there was no trace of him. “Three days later a shepherd came to us with his ID card. He has found it there while grazing his cattle,” said Shabir. 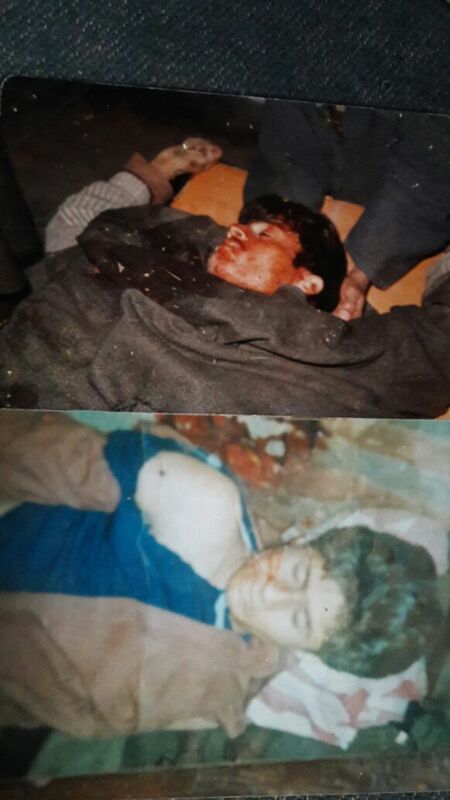 Then Jana visited State Human Rights Commission (SHRC), Srinagar and filed a complaint about her missing son. “They did nothing except giving false hope,” said Jana. In Srinagar, Jana knocked at almost every door, including that of separatists and NGO’s. “I tried to meet all three known separatist leaders but was not allowed,” alleges Jana. In 2005, Jana’s second daughter, Saleema, who was suffering from depression since her three brothers were killed and her father died, committed suicide by hanging herself in the kitchen. As for Jana, she still waits for her son Shreef-ud-Din. “Our mother died the day they killed our elder brother Latief. Now what is left is an old lady with lots of tragic memories,” said Shabir.